He didn't scream or stomp his feet. He didn't dazzle with his smooth delivery, or make us titter with a sharp wit. 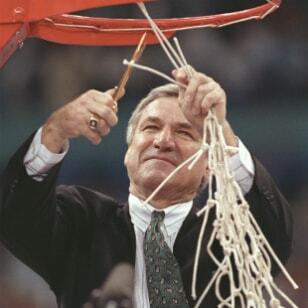 I am sitting here, the day after he died, trying to think of one great Dean Smith quote -- and I can't. He was never the most conspicuous guy in the room. Just the one, for the longest time, with the most victories. He was never the type to draw a crowd. Except for maybe that twang of a Kansas voice that invited imitation, the way his most shining star, Michael Jordan, invited autograph seekers. Former coaches end up sitting behind microphones as a television analyst. Smith was one of the last ones -- maybe the very last -- you’d want there. His sentences often would start one place and then break off into various lanes, like one of his renowned North Carolina secondary fast breaks. His mind was far too active to talk in a straight line. He was not the legend with a compelling and majestic personality, as vast as the adoring state around him. At least not to the outside world. Tar Heel blue, a quiet shade bespeaking a peaceful summer afternoon sky, was perfect for him. He was just the coach who built the program other men would love to have, and the record other men envied. Just the gentleman who stood tall for civil rights in the 1960s, and was still going to Final Fours in the 1990s. Just the professor of basketball, for whom the court was not a brightly-lit and gaudy stage, but a studious classroom. He had a Ph.D. in hoops. He was Dean. That was enough. That will always be enough. His numbers now will be duly trotted out. His 879 victories and 11 Final Fours and two national championships. His generational hold on the ACC. Ironic that he would be gone the same week Mike Krzyzewski passed him for most conference wins, for it is patently impossible to think of that league without Dean Smith. Or Mike Krzyzewski, for that matter. The numbers say a lot, but they do not say it all. They do not describe the remarkable way in which they happened. Not with the flash of spectacular individual heroics, or the thunder of theatrics. They were created with patience and purpose and the unwavering mission to get it right, as a unit. Dean Smith put together Tar Heels teams the way a painter puts together his landscape picture. Nothing out of place, nothing without a reason. Consider his most famous strategy as a coach, the "Four Corner" offense. A game-clinching, time-eating, opponent-killing concoction that was the scourge of North Carolina foes everywhere; heaven help them if they got behind in the second half, because nothing else could -- until the shot clock made it obsolete. Its success did not rest on the talents of one superstar, but rather the chemistry and timing of four Tar Heels in each corner, and another one in the middle, to make it all hum. If you could pass, and you could dribble, and you could move, and you could think, and you could work as one body, you could play the "Four Corner" for Dean Smith. The numbers do not give full justice to his creativity. How he used substitutions, how he used the space between the lines to maximum effect. The man knew x's and o's and every letter in between. But he also knew people, specifically those who would wear the uniform for him. Try to think of one Tar Heels player who ever had a bad thing to say about Dean Smith. Good luck. And we’re talking about kids from the pay phone 1960s to the cell phone 1990s. Several moments came to mind, upon hearing he had passed away. Take the night he finally got his first national championship in 1982, delivered by Jordan's immortal dagger from the wing in the final minute against Georgetown. Smith had not won a title his first six Final Four trips, and the subject had become so talked about that week, his middle name was Dean 0-for-6 Smith. I looked over not long after the game to see his reaction, now that he had finally reached the mountain top. Might there be some gushing, unDean-like celebration? You kidding? He looked up at James Worthy, one of his towering Tar Heels stars, and said two quiet words: "Thank you." There was the stricken look on his face at the 1991 Final Four, when he drew a second technical foul, and automatic ejection. Dean Smith thrown out of a Final Four game. Unimaginable. Fourteen years later, there was the look akin to that of a proud parent, as he stood near courtside in St. Louis and watched one of his guys, Roy Williams, win the championship. The attention was on someone else that night. Smith stayed off to the side, barely noticed. He didn’t seem to mind. There was two years ago, when I stopped by his office in the arena that now bears his name. The neurological disease that eventually took him already had him in its grip then, and it was heartbreaking to listen to Bill Guthridge, his former assistant, close friend, the man who took his place in 1998. "Dean Smith could remember everything and everybody," Guthridge said that day. "And now he can't." I asked Guthridge if Smith still understood what he had meant to his school, to his state, to his game. "I'm not sure," Guthridge said. "It's very hard." But everyone else should understand, especially now. How once upon a time a gentle man who taught basketball and life lessons made North Carolina one of the fairest of them all. With grace and dignity, and precision and planning. In the Carolina Basketball Museum are two letters Smith wrote to Jordan after the 1982 and '83 seasons. In both, he listed several ways Jordan could improve his game. He never stopped teaching, he never stopped winning. He never stopped being Dean Smith. That was enough. That will always be enough.